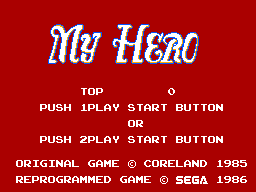 My Hero is a beat-em-up title. 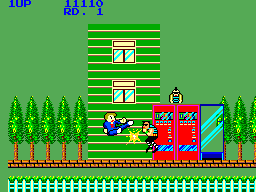 Because it's a beat-em-up, you think it may be like River City Ransom for the NES? Wrong. While THAT game has replay value, THIS game has none. Why? 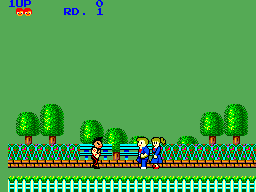 It takes everything you loved about River City Ransom and tarnishes it. A reason I don't like the gameplay is because it's HARD. If I could choose difficulty above hard, I would. You die in one hit. If that doesn't make you run away from this game, everything else will. Ew. Just ew. There are two attack buttons; one is for punching, and one is for kicking. Punching will have you stop in your tracks in punch in front of you. Bad guys come from EVERYWHERE, so they WILL punch you from behind. Kicking isn't much better, either. Kicking is also the jump button, so landing on a guy will have you die. And I don't know if it's just me, but I found it really hard to move my character. Zilch. Nada. Nope. The only reason I kept replaying it was so I could write a review of it. But I have a challenge for you if you ever decide to play this game: Play for 30 minutes without going insane. But then again: don't. If I can save a few people from playing this game, then it would do the world a huge favor. But it's to late for me now. My Hero is an abomination. Everything about it is horrible, and I mean absolutely EVERYTHING, from it's toes to the top of it's head. The Master System was a pretty good gaming console, but with games like THIS... It's no wonder that the SMS couldn't stand up to the NES.